The Cabinet War Rooms are the preserved historic site where Prime Minister Winston Churchill sheltered during the Nazi bombing raids on London and where he met with his War Cabinet, his generals and his military planners, while the bombers laid waste to London overhead. So it comes as something of a shock to anyone visiting the site to find that you only descend one floor, about 20 feet. Surely he would be like Hitler, Mussolini and Stalin, hunkering down hundreds of feet below ground with a lot of concrete, steel and ballast between him and the surface? The explanation for his being so at risk lies partly in a slightly typically British bit of muddled planning, but very largely in the trademark fearlessness of the man who, throughout his life, liked to lead from the front and always be where the action was. When the War Rooms were first envisaged, however, it was not for Churchill – at that time still in the political wilderness – nor even for the War Cabinet of the then Prime Minister, Neville Chamberlain. In 1938, despite Chamberlain’s promise of ‘peace in our time’, the military planners were contemplating a likely war with Germany, a war in which aeroplanes would fill the skies of London and devastate the capital with massive bomb loads. Their first thoughts for the protection of the small core of government, the ‘War Cabinet’, involved evacuating them to specific large houses in the Cotswolds, where they should be out of harm’s way. The Spanish Civil War in which, for the first time, bombers were used on a large scale to bomb populated cities, caused the planners to reconsider the likely casualty rates and to greatly reduce their calculations of casualties. As a result, the plan to take the War Cabinet out of London was also reconsidered and the idea of keeping them in London was mooted. Work had begun in the summer of 1938 to convert an old storage and working basement in the Government Offices Great George Street building (GOGGS), which was occupied by the Office of Works, and to house military planners there. Its central location in the government quarter of London and the steel frame of the building above led them to think of it as an ideal location in which to house the War Cabinet, though little thought seems to have been given to making it bomb-proof. 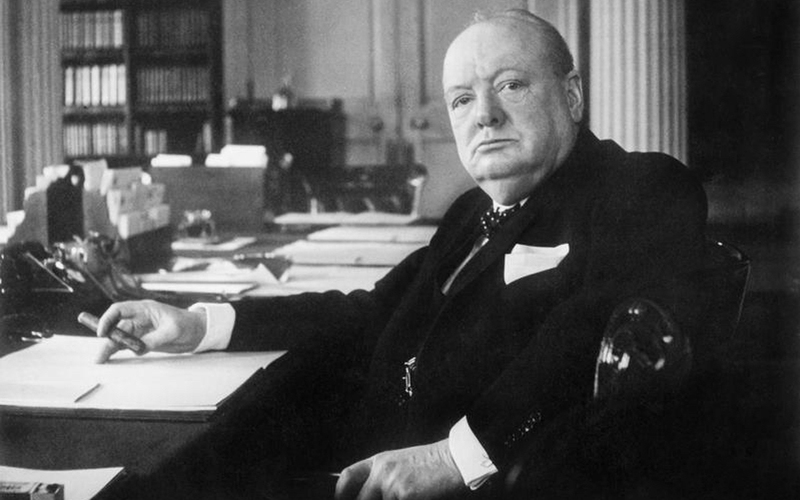 By the time Churchill became Prime Minister in May 1940, the war had moved to a different phase, as the Nazi war machine progressed westwards into France, Belgium, Holland and Scandinavia and the threat of invasion came ever closer. As the bombing raids on Great Britain began in the summer of 1940, Churchill initially shunned his ‘bunker’ but after his house, No 10 Downing Street, was seriously damaged in an air raid, he was obliged to move underground. Ironically, the basement of the GOGGS building was far from safe and any single bomb of the tens of thousands dropped on London in the Blitz could have destroyed him, his War Cabinet and the whole military planning machinery for the British war effort. His faith in the statistical unlikelihood, ignoring the random nature of bombing, and his penchant for watching enemy air raids from an exposed position on the roof of the building above, are now part of his legendary disregard for his own safety, but were in fact sources of great concern among those tasked with ensuring his and his government’s safety. Months after The Blitz had begun, enough concrete and steel was jammed into the floor space above the CWR to make it proof against a 250-kilo bomb, but it took three years to complete. The complex was large and housed several hundred people, apart from the War Cabinet, who worked in shifts around the clock and whose sleeping accommodation was a shallow and squalid cellar one floor below the War Rooms. Almost all of the rooms that housed these people were re-used after the war, when accommodation was chronically short, millions of buildings having been destroyed in the bombing raids. However, with a keen eye for history, the principle rooms of the complex were kept just as they had been left when the war ended on 15 August 1945. The Rooms became a branch of the Imperial War Museums (IWM), which opened them to the public in April 1984. What was initially given to IWM was only the 1939 footprint, but, in 2000 the Churchill War Rooms gained almost all of the space occupied by 1945 and, in 2005, to mark the 40th anniversary of Sir Winston’s death, the restoration was completed with the opening by Her Majesty the Queen of the Churchill Museum. Phil Reed OBE is the former Director of the Churchill War Rooms and now runs a museum consultancy agency.